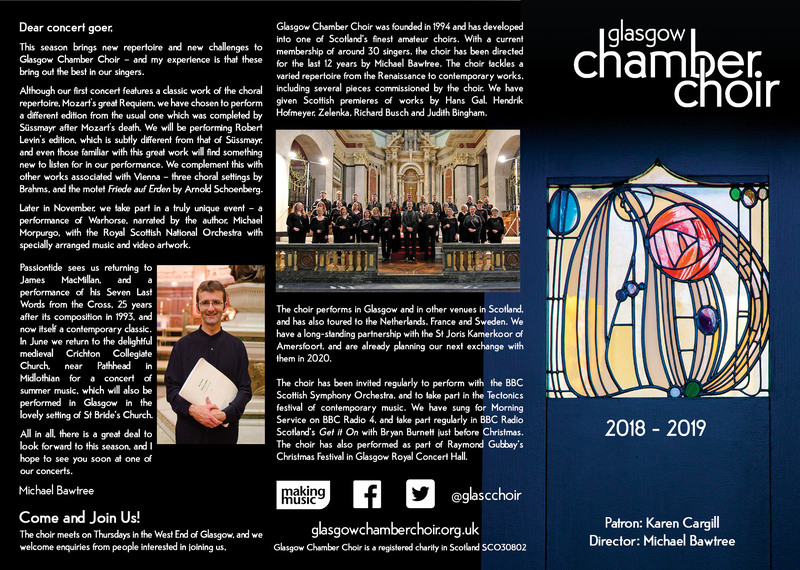 This 2018-2019 season brings new repertoire and new challenges to Glasgow Chamber Choir – and my experience is that these bring out the best in our singers. Although our first concert features a classic work of the choral repertoire, Mozart’s great Requiem, we have chosen to perform a different edition from the usual one which was completed by Süssmayr after Mozart’s death. We will be performing Robert Levin’s edition, which is subtly different from that of Süssmayr, and even those familiar with this great work will find something new to listen for in our performance. We complement this with other works associated with Vienna – three choral settings by Brahms, and the motet Friede auf Erden by Arnold Schoenberg. Later in November, we take part in a truly unique event – a performance of Warhorse, narrated by the author, Michael Morpurgo, with the Royal Scottish National Orchestra with specially arranged music and video artwork. Passiontide sees us returning to James MacMillan, and a performance of his Seven Last Words from the Cross, 25 years after its composition in 1993, and now itself a contemporary classic. 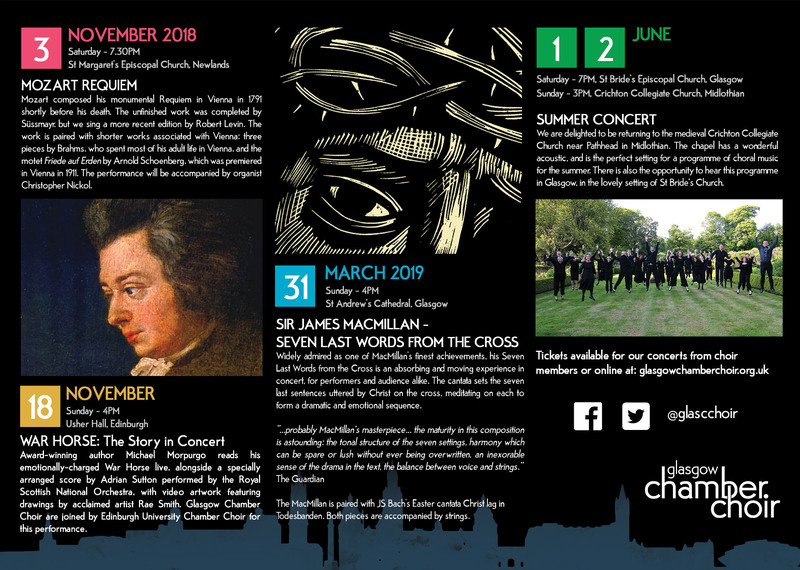 In June we return to the delightful medieval Crichton Collegiate Church, near Pathhead in Midlothian for a concert of summer music, which will also be performed in Glasgow in the lovely setting of St Bride’s Church. All in all, there is a great deal to look forward to this season, and I hope to see you soon at one of our concerts.